Still Alive: Richard Matheson | Birth.Movies.Death. Every month we stop and appreciate a great badass still among the living. This month: Richard Matheson, possibly the most influential genre writer of the 20th century. 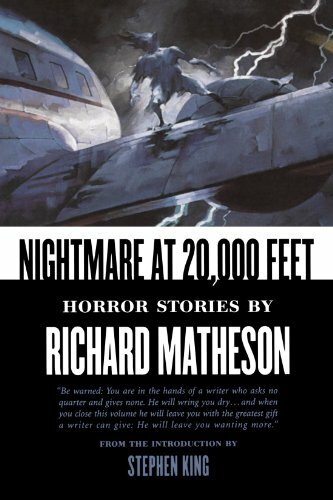 Few writers have had as large an impact on their culture as Richard Matheson. Matheson’s mark is everywhere, and his ideas have helped to embody the soul of popular entertainment as we know it. I met him once years ago and I talked about it for weeks. I told friends, casual acquaintances, the guy at the convenience store, everybody. With the exception of a few film nerds and book dealers, the name drew a blank. But when I started naming credits, it got a response, even though I detected traces of doubt in their faces that one man could have been responsible for so many iconic stories. But it’s true. 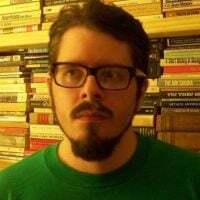 The same guy wrote (or wrote the stories that became) The Incredible Shrinking Man, I Am Legend, Duel, Somewhere In Time, What Dreams May Come, even Jaws 3-D and Real Steel. He also wrote many of the most memorable Twilight Zone episodes including Nightmare At 20,000 Feet. He scripted the brilliant TV movies that introduced Kolchak, The Night Stalker. The finest Roger Corman Poe adaptations were from his screenplays. That TV movie with the African doll that comes to life and attacks Karen Black: that was his too. His novels and stories, with their ironies, twists and real human interest are likely to provide the backbone for new generations of Hollywood sci-fi movies. I Am Legend and The Incredible Shrinking Man have inspired dozens of adaptations and ripoffs alone. I remember when we were at Matheson’s home my friend Jason Eisener asked the great man his opinion on the various movie versions of I Am Legend. Exactly at that time another member of our party blew his nose with a loud honk. Matheson, acknowledged the honk and said “That’s about how I feel about them.” His stories are so perfect and so perfect for the screen. Even his works that have never (yet) been adapted for movies, are full of cinematic imagery and pace. The conflict in Matheson’s story is often between reason and illogic. The heroes of Duel and Nightmare At 20,000 Feet react in different ways to the threat and in I Am Legend, the protagonist forges a sort of unsteady detente for a while. His stories are very much of the post-war era zeitgeist, in which science, in the service of civilization, wrestled with primitive forces from within and without, occasionally becoming infected. The Matheson model led to much of what we think of as “horror” today. Stephen King has called Matheson his greatest influence and we can see Matheson’s style in much of Steven Spielberg’s work. Through the work of these two influential apostles, many others, and indeed through his own work, Matheson’s vision has become the foundation of imaginative, escapist cinema and popular art. A Matheson novel or story is a virtual passport to escape. They are like logical dreams - pulp in the best sense, not insulting to reason or imagination. And for all of you who derive most of your entertainment from films, there’s that cinematic pace - the pace that makes everyone who reads him think “that would make a great movie”. There aren’t many masters, alive or dead, in Matheson’s class. His narrative inventions are the engines that power so much of our most cherished artistic forms. Hopefully other Mathesons will come along to write new myths for us in the new century, but in the meantime we’re happy just to have this one.